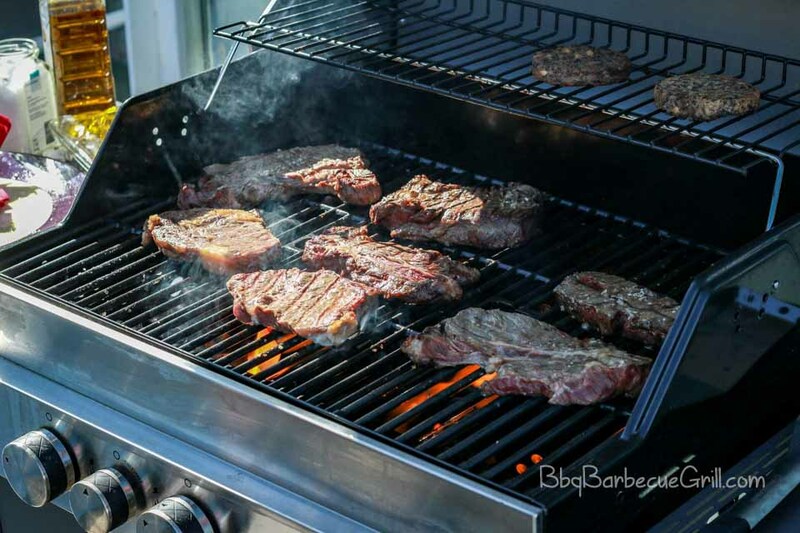 Home » Other » Electric Grill vs. Gas Grill: What’s the Difference? Electric Grill vs. Gas Grill: What’s the Difference? If you’re looking at grills, you’ve probably been introduced to the alternatives to coal. There are a lot of reasons to make the switch from coal to an electric or gas grill. Coal is one of the most carcinogenic fuel sources out there, and if you live in a multifamily dwelling, chances are that you’re banned from grilling within 50 feet of it. It’s easier to just avoid the hassle of angry neighbors or landlords and get yourself an electric or gas grill. That’s why so many people choose electric or gas grill right off the bat for their backyard get-togethers. Electric and gas grills both have distinct features as well as pros and cons. Let’s take a look at these types of grills in more depth. Let’s start with the basics. Electric grills obviously use electricity as their fuel source. They need to be plugged into a wall to work, although you can also plug them into an extension cord if you choose. Gas grills, however, can use either natural gas or propane. Electric grills, whether indoor or outdoor, can be plugged directly into an electrical outlet. Gas grills get fuel either from a natural gas line or from a propane tank. The tank is more portable but can be dangerous if it leaks. When your grill is connected to your home’s gas line, it’s not really portable at all. Both natural gas and propane are unsustainable fuel sources. While they’re not carcinogenic like coal, they do contribute to the destruction of the environment. The electric grill has been a mainstay of modern cooking since the early 2000’s when George Foreman grill first came on the scene and changed the way that Americans grilled their meat in a way nobody had quite imagined. Cooking on charcoal was easy and fast, but when electric grills entered the mix, there was a new way to cook up salmon, grilled burgers, and even breakfast items like eggs efficiently. Is an electric grill healthier than other grill types? It can be, but if you choose lean cuts of meat anyway, there’s not a huge difference. 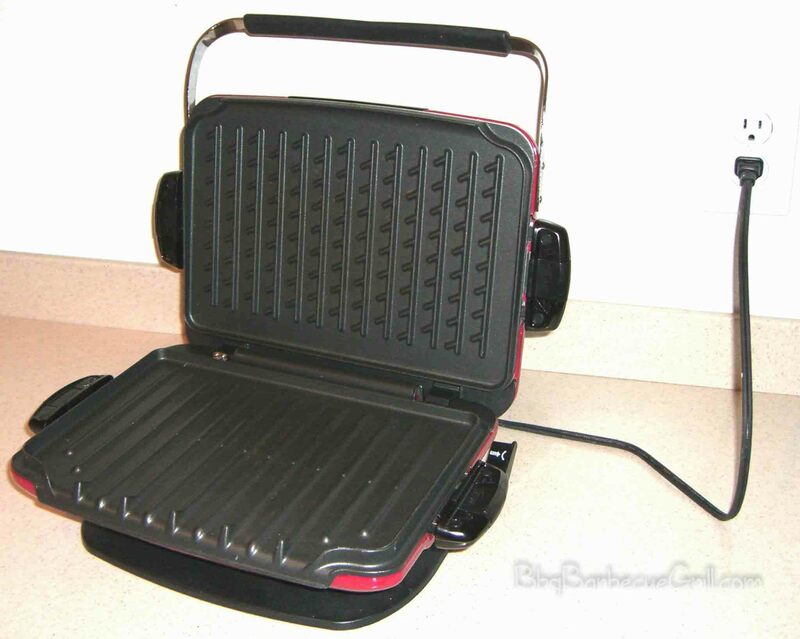 A clamshell grill will typically “melt” the fat off until it lands into the catch dish, and the Foreman grill claims to reduce fat by over 80%. One of the biggest pros of the electric grill is that it heats up in a few minutes. It also melts fat off of whatever cut of meat you put into it. The fat is caught in a dripping tray that is usually removable. Many electric grills have removable plates that are super easy to clean once you’ve finished up. Electric grills usually come in personal-size and a size that’s suitable for larger families of four. You can also find electric grills on the market that can cook up to 15 servings at a time. It all depends on who you plan to grill for. Electric grills usually come in two styles — the clamshell contact and the open grills. The clamshell opens up, similar to a clam, and then closes. When this happens, the contact part of the grill begins to work and you can press it closed to cook your selection. The open grill is meant to simulate outdoor grilling and uses a single heating element. There are also electric smokers on the market meant to cook turkeys, chickens, and various kinds of kabobs. Electric grills can get quite hot so it’s important, but they don’t consume a lot of power. Many of them can’t survive extreme outdoor weather or temperatures. Always check to make sure the grill you are using can work well in outdoor weather and is away from water sources. To start off, gas grills are usually smaller. Gas grills are usually built to run on either natural gas or propane, but most of the grills contain fittings that allow you to switch between them. Propane is less expensive than natural gas if you’re looking to pinch pennies. Gas grills are a little more diverse. They can have multiple burners, side burners, cook kebobs and even allow users to cook over an open, gas flame. Gas grills, known as flattop grills, are actually more like griddles. Some gas grills emulate charcoal grills by slow burning wood chips to give the food a more authentic flavor. Gas controls on many units are measured by degrees like a regular stove, and this allows you to control the heat at one specific setting. Gas doesn’t work well at slow cooking at low temperatures (think: 225-250F). If you plan to slow grill, check out the outdoor electric grills. What Expertise is Needed for Each Grill Type? Using an outdoor electric grill shouldn’t be too difficult for most beginners, in fact, most electric grills are meant to be portable. Some, however, are built for countertops, which means that they have short cords. Electric grills usually have a dial for the temperature or a gauge, which specifies the “doneness” of the food you’re cooking. Other than a feel for the grill you’re using, an electric grill is often plug-and-play. Make sure you read the instructions, especially when cooking meat, as every grill is different and takes getting used to. If you are hooking up a grill to the gas line, you should be comfortable and know what you’re doing. If not, then an expert visit will probably be in order. You can have an installation company fit your grill to your gas line. If you’re using propane, then no expertise is involved when setting up. There are more safety hazards to watch out for with propane grills than the other types. Upkeep is the real issue for propane tanks. Make sure to keep the propane outdoors at all times and away from the building structure. Propane tanks should be regularly inspected for leaks, which you can notice either because there is wetness near the tanks, a hissing sound or a strong smell of gas. If you detect a leak, then it needs fixing ASAP. This is something you can probably do yourself. Learn more about fixing a propane tank leak or what to do to prevent your tank from freezing. Propane, gas and electric grills are all great options for grilling. When choosing a grill, make sure to read the reviews and learn about the features. In the end, the grill you choose should match your budget, lifestyle, and, of course, personal taste.